You can now 'sponsor' the Andertons Youtube channel...apparently. EDIT - Now retracted for Patreon..
- paying guests (might come as a shock to know that Steve Vai, John Petrucci et al don't do this sort of thing for free)...etc etc. Ooooo now that is interesting. Any ideas what the rate is? Unless of course they have an album/tour/product to plug and then it would be less/foc? Absolutely no idea, and sometimes they put those on in conjunction with masterclass appearances (which are promotion in themselves), so it's probably a bit hard to quantify. Still, I can't imagine it's cheap for the higher-end guests. Out of curiosity how many of you chaps are patrons of any of the YouTube channels you watch and if so which ones? I give to Adam Neely's Patreon. They had an advert on the back cover of Guitarist boasting about 100,000,000 YouTube views. This is what your channel subscription will pay for. Why would they need to keep a soundproof room away from the noise of the warehouse and the shop? Aren't these guys paid by the guitar manufacturers to promote their products? Seems a bit to me like they want to have their cake and eat it. If Richer Sounds came out and said they're making a loss on their video and promotional material, no one would sponsor them. Even if they do make a small loss on this side of the business, it is certainly in part advertising, so they can't complain too much because the bread and butter of their business wouldn't be thriving as much without the YouTube presence. Not to mention all the exposure it's given the guys involved, who now all gets tickets to all the events round the year, get to go and do stuff with other brands etc. I think it's just Andertons being Andertons, they're forward thinking, they explore new revenue streams, and I guess despite a few of us thinking it's a bit cheap, overall they'll still be better off financially in the end, and money means far more than integrity these days, apparently. money means far more than integrity these days, apparently. It ought to, if you have employees with families to feed. Nothing noble in going bust and putting them all on the dole if you can legally and ethically avoid it. I know, I've had to downgrade my wife from a Bentley to a Range Rover to take our Labradoodle to puppy training classes in, hence I'm also starting a patreon. Because the shop and the warehouse kick out more noise than they can keep out at reasonable cost, self-evidently. Ahhhh...so it's not that musicians should do it for free in return for the exposure, they should do it for free in return for their endorsers' exposure? Got it. Why don't you give Steve a call and book him for an event, then tell him he's doing it for free on that basis? Let us know what he says. I'm pretty sure he's suggesting that they're paid by their endorser to do these videos, not just endorsing their endorser for free. Not sure about the Vai one, but the Petrucci one was very Musicman heavy, as were Nick Johnston and Keith Merrow with Schecter; do these guys not get paid by their endorsers for doing this? I've bought a few things from them and I've only heard of them from YouTube. One product they were the exclusive dealers but the other 2 are sales they've made from their channel. Saying that, I've bought from other places that don't have YouTube channels so I might well have found them through Google anyway. The channel is 100 percent to promote sales though, there are no objective reviews what so ever. There's a video of some amp modeler that they were trying to shift and it gets compared to the Amplifire. The Amplifire could have been set better by a monkey so it seems to me that it was deliberately meant to sound worse than the focused item. Yet compare that to the video where they are promoting the Amplifire itself and it's apparently indistinguishable from the tube amps it simulates. Basically treat the videos as infomercials, not sincere reviews. What are they selling when they interview a big name player? The big player's signature gear? Genuinely curious - have you ever read an endorsement agreement? All the ones I've seen put a responsibility on the endorsee to promote the endorser's products at every relevant opportunity, and that's a base requirement for the rest of the agreement. Manufacturer-specific clinics and the like will usually be paid appearances, but not interviews and such. Yeah, I assumed Vai was getting paid by Ibanez to promote Ibanez guitars, a clue being the row of Ibanez guitars lined up behind him. Anyway, regarding the sponsoring issue, I feel Andertons are straying out of their lane here. I'd be more inclined to look at the 85% of the market that they currently cannot monetize by looking into promotion/distribution/licensing/partnership deals in the US/Europe, etc.. The long term goal should be structuring the business so that they are able to compete against the likes of Thomann, Musikhaus and Music Store, not tapping up YouTube viewers for their loose change. It all seems a bit bizarre to me, if not a little egotistical. Plus Andertons often tie these interviews into masterclass events they hold, so the agreement for paying an artist for one of those events will probably entail an interview as well. So if it's all about cost, maybe they could branch out into doing cookery programmes for TV. That should cover the cost of the equipment and premises. Or maybe they have bitten off more than they can chew, and they need to scale back a bit? So it's not free? Damn you and your inconvenient facts. It makes no sense for Andertons to be paying Steve Vai loads of money to do a YouTube video that makes no money, and is mostly watch by people who can't buy anything from them. They could just contact Ibanez and say they are willing to plug Ibanez Guitars globally on YouTube for £X amount, with Chappers supplying the licks and Lee providing the banter. PS Andertons Vai video currently has 352,591 views. Did they ask for donations to cover the cost of Vai promotion? Or did they pay him his fee based on the fact that they calculated that overall he added more value overall than his fee? Steve Vai was around £20K appearance fee, but its more than that, usually its flights, 5 star hotel, limo etc, Nile Rogers was £25K + etc, I'm told Nita Strauss is £10K + etc. One thing you have to bear in mind is that, whilst Steve Vai maybe an Ibanez endorsee, Ibanez is distributed in the UK by Headstock Distribution, therefore they don't have any real deal with him, Ibanez Japan may send him over to do something, but unless it comes from HQ its a deal between Steve Vai and whoever wants his time. You find some golden ones out there that don't charge, but they are few and far between. Have you ever looked at how much first class flights are from Los Angeles (that is pretty much where they all live) and London? 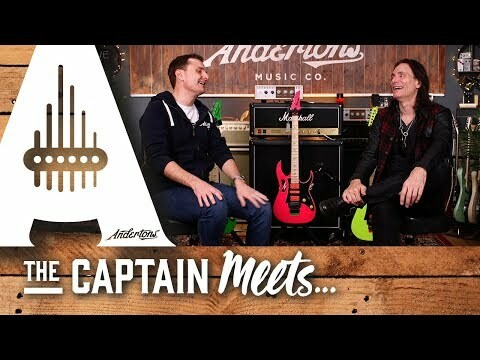 It makes no sense for Andertons to be paying Steve Vai loads of money to do YouTube video that makes no money, when they could just contact Ibanez and say they will plug Ibanez Guitars globally on YouTube for £X amount, with Chappers supplying the licks and Lee providing the banter. Who said that such videos make no money? You're making assumptions again. If you watch the videos where he talks about it, Lee says quite clearly that the YouTube channel isn't there to make money, but to foster a community (much like we've done here, except he's been orders of magnitude more successful at it). This whole thing basically says to me that he's decided that he's tired of it being a loss-leader and wants it to break even - much as we decided fairly early on. We asked for donations from our members (the people who are invested in the service that we provide); that's no different to what he's doing here, in asking his subscribers (coincidentally, the people who are invested in the service he provides). I find it vaguely amusing that most people on this thread seem to think that they know more about the music business and YouTube channels than he does, when the entire industry (ie the businesses) look to him for guidance on how to build a successful channel (in terms of popularity and coverage) to accompany their businesses and take them into the modern online world, and not this forum. And yet...everyone here thinks they're an expert on his business, his costs, how he should be running his channel and even how much it costs to get celebrities on it. Have you ever looked at how much first class flights are from Los Angeles (that is pretty much where they all live) and London? It is far far easier and much less effort to criticise someone else and their business model than it is to develop and run your own. Its likely that it was just a fee for a couple of hours, I'm not a Vai fan so I haven't been taking any notice of a UK tour or an Anderton's youtube promo. No one is suggesting that what he's doing is questionable from a business position, if there's one thing I'm very sure of it's that from a financial standpoint he/they will be better off. That doesn't stop people questioning whether it's the right thing to do, just because it's profitable. This forum needs to break even because it's not subsidised nor does it directly generate business for another area, but in the case of Andertons, if the YouTube stuff doesn't break even, then it's still contributing to brand awareness and image, it is landing them sales. Some aspect of their YouTube venture is marketing; your marketing department doesn't break even or make a profit directly, so why should part of Andertons? If Fender came out out and said that the YouTube aspect of their business wasn't making any money, so they want to run a patreon for it, people would just say they're taking the piss, that they should run it at a loss on an individual basis because of what it brings to the business overall. Actually, that's exactly what quite a few of these posts are doing. Some aspect of their YouTube venture is marketing; your marketing department doesn't break even or make a profit directly, so why should part of Andertons? So...even though there's an industry-standard way to cover those costs (I'm talking about the online content production industry) by giving regular viewers more content that they're interested in, you're saying that Andertons shouldn't do it because...what, exactly? Some outdated notion that marketing should always cost money and never directly cover its costs? I think the part that a lot of people are finding hard to understand is that there are a lot of people who see value in the content on the Andertons channel in an entirely separate sense from the shop. Whether that's because they're fans of the people on the shows, or because there's useful information there, or they find the content useful when deciding to buy from somewhere else, or whatever. There are roughly 427,000 of those people, and you'd have to be utterly insane not to offer those people the opportunity to voluntarily support the channel. It's easier to criticise the England World Cup squad than it is turn pro and join it, so on that basis we can no longer criticise it? So, when he uses the existing - and well-established - opportunity to monetise some of that 85%, you carp and criticise and imply that this is all for his ego. Got it. Besides that, if we start paying £4.95 a month for one YouTube channel, then taken to it's logical conclusion it means we should be paying for every website, and every YouTube, Twitter, Instagram, Facebook and Snapchat account that gives us enjoyment and pleasure. Not at all. I’m just saying it’s a lot less effort to criticise. Dare I say it, it’s much easier in the internet age to publicly air our critical opinions on anything we like. It takes five minutes to criticise in an internet post. Hardly any effort at all. But it can take years to build a successful business, or become an international footballer. No longer criticise? Not at all. Anyone can criticise as much as they like. However, in the internet age it seems to be a given that any opinion posted is as accurate/knowledgable or indeed valid as any other.